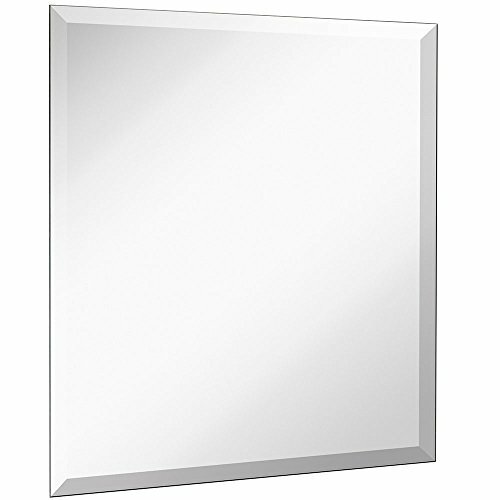 SOPHISTICATED DESIGN: One of our Best Sellers, this simple yet elegant 24" x 24" beveled square mirror is a favorite. A sleek, modern, clean, beveled edge. A floating, frameless design with our solid core wood backing for reinforcement and stability. Avoid the warping and distortion found in cheaper brands. SAFE AND EASY TO INSTALL: Our authentic silver backed glass comes with safety polished edges for protection and a finished appearance. Glass is securely mounted to solid core wood. All mirrors come with reinforced D-ring hanging clips as well as wall hardware and screws to hang easily and rubber bumpers to protect your wall from damage. 3 GENERATIONS OF EXCELLENCE: Our family has been manufacturing and producing mirrors for over 3 generations. We stand by the quality of our product and your experience. A family owned business with simple principles. Affordable quality in America with a 100% SATISFACTION MONEY BACK GUARANTEE. EXCEPTIONAL QUALITY: We use premium materials not found in other lesser quality imitation mirrors you will see. Our mirrors are made to strict trade-secret standards and pass a rigorous 8 point inspection. Every mirror comes with our certification of authenticity. 100% MONEY BACK GUARANTEE: Order our Hamilton Hills mirror and see for yourself. If you don't absolutely love our product, let us know and receive a full, no questions asked refund. We are a family owned business that stands by your happiness. If you have any questions about this product by Hamilton Hills, contact us by completing and submitting the form below. If you are looking for a specif part number, please include it with your message.